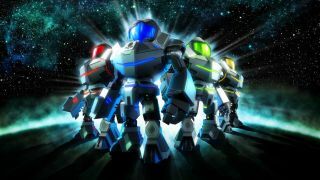 Metroid Prime: Federation Force has a set of official release dates, nearly a year after it was first revealed back at E3 2015. Nintendo confirmed that the 1-to-4 player co-op 3DS shooter will come out in the US on August 19 and in the UK on September 2. Rather than doing the usual Metroid thing and letting players explore a lonely, dangerous world as Samus Aran, Federation Force sends teams of players into battle through several smaller mission areas. Many fans were angered that the first Metroid game in six years (and that's just since Metroid: Other M, which wasn't much of a crowd pleaser either) was a co-op game starring a bunch of cartoony marines in giant robot suits. In a few months we'll get to see whether it can at least make good on that premise. I'm a pretty big fan of most things missile upgrading and space-pirate blasting, myself. While I'd prefer a new side-scrolling Metroid most of all, I'm interested to see how Federation Force turns out. I just hope that Nintendo takes some serious lessons from The Legend of Zelda: Tri Force Heroes and improves the infrastructure for Federation Force's multiplayer; no more losing all your level progress if somebody disconnects, please.